If you love audiobooks as much as I do, you probably have an Audible account…If not, I have some great news and a surprise waiting for you…just make sure you read this blog post through to the end! If you love mystery, romantic suspense, time slips, thrillers and stories with a dusting of magic or a sprinkle of supernatural paranormal, then please don’t miss Lake Lanier Mysteries. A romantic suspense thriller, with a time slip…A ghost town time forgot––A romance you’ll remember forever! 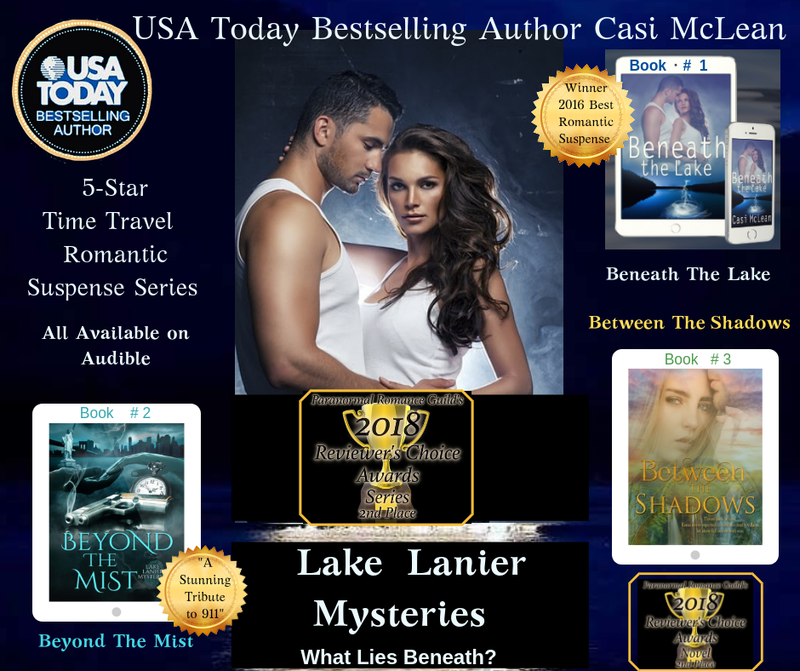 This multi-award winning series will grab your heart in book one, BENEATH THE LAKE, spiril onto a rollercoaster ride into book two, BEYONED THE MIST, and won’t let go until book three, BETWEEN THE SHADOWS, ends in a satisfying happily ever after that will linger in your mind long after you read THE END! But don’t take my word for it…listen for yourself. I’ve taken an audio clip from each breathtaking story below. Scroll down and give these stories a listen for #FREE. A ghost town time forgot––A romance you’ll always remember! But Wait…there’s more!CLICK HEREfor a full chapter from Beyond The Mist! Still want more? Click here Between The Shadowsfor a full chapter! I PROMISED YOU A SURPRISE AND HERE IT IS––You can get Beneath The Lake #FREE on Audible with a new subscription. So CLICK HERE and get started. Discover the magic!